At noon on January 20, 2017, Donald Trump was sworn in as the 45th President of the United States. In a relatively unpublicized move, all foreign ambassadors were told to leave their posts by the afternoon of the same day. This included the then U.S. Ambassador to Haiti, Peter F. Mulrean, a career member of the Foreign Service. Haiti, the poorest nation in the Western hemisphere, looked upon this action with a mixture of anxiety, apprehension and hope. Would a new Trump appointment make a difference? Is it possible that Trump could or would actually "drain the swamp" of corruption and misery that holds the island nation in a vice grip? The United States and the United Nations are culpable in the seemingly eternal poverty, as well as a cholera epidemic brought courtesy of the United Nations. Is it possible to change a system of corruption that is institutionalized and wrapped in the mantle of failed foreign aid? Recent news reports are not encouraging. The Miami Herald reported this week that that Haiti's incoming President, Jovenel Moïse is under investigation by Haiti's Central Financial Intelligence Unit for money laundering and special treatment in business loans. Moïse will be sworn in on February 7. Then there is the recent arrest in Haiti of Haitian-elect Senator, Guy Philippe, who has been extradited to the United States as a DEA most wanted fugitive. Philippe's case is on the docket in Florida's Southern District Court in Miami. The recently unsealed indictment by the United States Attorney's Office (USAO) lists charges including a 2005 count of conspiracy to import narcotics; one count of money laundering; and another of engaging in monetary transactions derived from unlawful activity. From 1997 to 2001, Philippe was engaged in a conspiracy to import cocaine into the United States. The swamp is deep in Haiti and began filling over 200 years ago under French occupation. Now the fetid waters of exploitation and corruption are spilling over into the drug culture on U.S. shores. Why it took so long to arrest Philippe when he was openly moving about in Haitian society is anyone's guess. The suggestions on how President Trump might begin this effort should come from Haitians and not American beltway pundits. How can Trump help Haiti without additional meddling? The appointment of an Ambassador with deep knowledge of Haiti is certainly the first step, but the real influence on U.S. policy will come from within the inner reaches of the State Department. Many of the career employees there already have their hands dirty. In that regard we approached three Haitians from various backgrounds with knowledge of history, politics, economics and the social fabric of the country. We asked for creative and practical ideas on how the U.S. might assist Haiti in the future, while loosening the shackles of international meddling and allowing Haiti to tap into the wealth of intellectual and physical resources that she possesses in abundance. Bernard Sansaricq is a former President of the Haitian Senate (1994), now a U.S. citizen and consultant. Drawing on these themes, Sansaricq offered a detailed list of problems the Trump administration faces. "Haiti has become a country of total corruption and criminality," he wrote. Among the accusations are politicians stealing money from the Treasury, a drug trade that has evolve into "common currency," money laundering that has become "smart investment," "pay for play," a Parliament that "is a refuge of thieves, criminals and drug-dealers," and a corrupt and manipulated judicial system. Sansaricq would like to remind Trump that Haiti has resources that are robbed by international players. 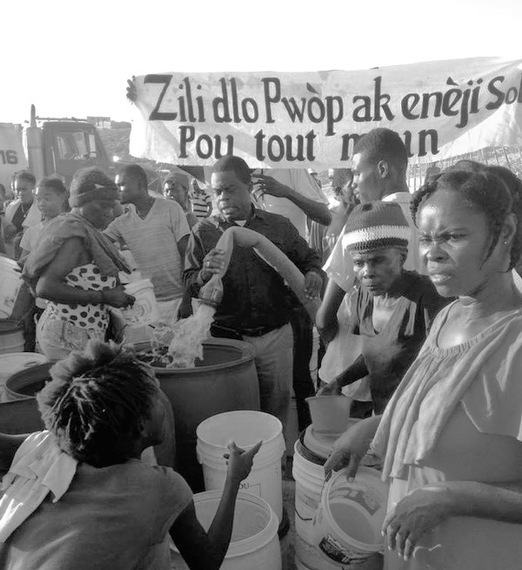 "Foreign interests and their meddling into Haiti's affairs are depleting all our resources: gold mines, bauxite, copper, petrol and contracts for importing rice are gracefully accorded to foreigners." The list is long and heinous, and we are providing a link to Sansaricq's Memorandum here. A Department of State with a deep knowledge of Haitian history and U.S. involvement in destabilization efforts under Republican and Democratic Presidents alike is necessary. From the 1986 overthrow of President-for-Life Jean-Claude Duvalier in a popular uprising under Ronald Reagan; the 1991 coup and overthrow of President Jean-Bertrand Aristide under George H.W. Bush; the 1994 return of President Jean-Bertrand Aristide by force under President Bill Clinton; the second ouster of Aristide in a 2004 coup under George W. Bush; and finally the installation of President Michel Martelly through the machinations of the Obama White House and Secretary of State Hilary Clinton, there is plenty of reason for a hands off policy in the Trump Administration. So, how can the U.S. help in an advisory role, without hindering Haiti? Sansaricq offers some concrete suggestions to POTUS. The last two elections in Haiti are widely viewed as fraudulent, and the Clinton email scandal offered evidence that the election of Michel Martelly was engineered by the Obama/Clinton State Department. A similar cloud hangs over President-elect Moïse, a banana exporter, who actually campaigned under the "Banana Man" banner. The handpicked successor of Clinton favorite Martelly, Moïse will follow interim President Jocelerme Privert, a former Senate leader and opponent of former President Michel Martelly. •	Dissolve all monopolies held by Oligarchs, and push for a true real free enterprise system to increase food production and create employment. Whether or not Haiti will realize Sansaricq's vision of honest elections in 2-3 years remains to be seen, but the former President of the Haitian Senate holds great faith in Donald Trump. Whether Trump is successful in eliminating DOS officials and staffers tied to past shenanigans in Haiti also remains to be seen. Sansaricq remembers when then-candidate Trump came to Little Haiti in Miami in September--the only candidate who met with the Haitian Diaspora. After listening to a litany of U.S. wrongs in Haiti, Trump took a few moments to greet Sansaricq. "I felt a personal connection (to Trump). When he shook my hand, pointing his finger at me, he said: 'I know you.' We had never met before, but the connection was there." Dr. Georges Michel received his law degree in 1992 and his medical degree in 1973. He is a journalist, author, historian, and was also one of the architects of the Constitution of Haiti (1987). Michel lives and works in Haiti. "Pétrole en Haiti" is a 2004 essay Michel wrote about the not-so-well kept secret that there are oil deposits that "straddle the boundary between the boroughs of Hinche and Mirebalais in a mountainous area located at the foot of the chain of the Black Mountains, direction due west of Thomond." His source was a 1908 physical and political map. He writes of local reports of oil seeping from the seabed near Les Cayes and reports similar phenomena in other regions of Haiti. In the weeks after the 2010 Haiti earthquake, villagers at the epicenter in Fayette, told this writer stories of wells turning black with a strange smell in the days and hours before the 7.0 quake. But untapped natural resources were not Michel's immediate concern when we asked him about the Trump administration. "What Trump can do here?" Michel wrote in his typical rhetorical flourish. "Undo the Clinton bad heritage here. In particular, helping Haiti to rebuild its military destroyed by Clinton and whose reconstitution has been blocked by the Obama administration. This is mandatory in order to finish with the foreign occupation still going on." It is important that Trump staffers understand that Haiti continues to be under occupation by the international community in the guise of U.N. "peacekeeping" forces. The occupation began in the summer of 1994, when the Clinton administration secured the reinstatement of the Aristide government by using United Nations Security Council Resolution (UNSCR) 940 to remove the Haitian military. This was the first resolution in the History of the United Nations that authorized the use of force in a member nation. It also provided for the reinstatement of the Aristide government and a six-month mandate for the United Nations Mission in Haiti (UNMIH). Now known by the acronym MINUSTAH, the U.N. forces never left. The Ambassador to the United Nations, Madeleine Albright, outlined a U.S. policy of "assertive multilateralism." During this summer, the United Nations issued a naval blockade with the hope that the specter of a U.S. invasion would force the Haitian leaders to surrender power. It did not work because no one understood the resolve of the Haitian people. By early September 'Operation Uphold Democracy' was underway with 25,000 military personnel from all services, two aircraft carriers, and air support. A smaller multinational army from Caribbean nations agreed to serve if the operation were carried out under a U.N. mandate. Historian Georges Michel's Reflections on Post Earthquake Haiti from Ashley Ellis on Vimeo. "The Haitian People have made a lot of progress, and this should be said." Dr. Michel also suggested former Haitian Senator Bernard Sansaricq in Florida, "would be very helpful." Michel had no idea at the time that we had already interviewed Sansaricq. When Georges Michel wrote to us about the "foreign occupation" i.e., the U.N., former South Carolina Governor Nikki Haley was being grilled at her confirmation hearing for U.N. Ambassador at the Senate Foreign Relations Committee about the same topic. When asked about the introduction of cholera into the water system by U.N. troops from Nepal in 2010, Haley called for accountability. "What happened in Haiti is nothing short of devastating. It is why I think it is so important the contributing countries take responsibility and take actions against those violators that are doing anything to harm the people they are supposed to be protecting," she said. In reply to Senator Edward Markey's question about increased financial commitment from U.N. members to build a sanitation system in Haiti, Haley called for more than accountability. The United Nations has finally, after seven years, admitted to malfeasance, but has done nothing to correct the damage it did. "Those violating countries around the world need to be held accountable and they need to have that responsibility of resolving the problem," she said. The clock is still ticking. This is certainly a priority for the Trump Administration. Time to stop the clock on cholera. Just Foreign Policy offer a real time Cholera counter here. 2294 days ago, the U.N. introduced cholera into Haiti. 862,510 have since taken ill. 10,932 have died. Both Michel and Sansaricq recommended Ezili Danto, an attorney with the Haitian Lawyers Leadership network, as a resource. Danto has been working for nearly a quarter of a century on justice for Haiti, pro bono. Born in Port-au-Prince, Haiti, and raised in Stamford, CT, Danto has already made great strides in emptying the swamp. She has spearheaded a clean water project and has written extensively on Haiti and President Trump's opportunity to make a difference there. As far as what Trump should do, Danto wrote, "As a lawyer, I work to apply the rule of law and equity to clean up the swamp. The rule of law, which means Trump should not do anything that even looks like regime change or imposing a provisional government." This marks a departure from Sansaricq's suggestion of an interim government, given the questions surrounding the election of Moisre and his alleged criminal activity. But, good people and great minds do not always agree. "I don't want to scrape the entire presidential elections and wait two or three years. I agree with Bernard that we must drain the swamp. In my view the neoliberal state forced upon Haiti by Clinton-Bush policies has weakened the state to such an extent that only gangsters with money can get justice," Danto says. "When the weakened state applies the law, the gangsters buy judges or simply break their friends out of jail. So an entire overall of the justice system is necessary. The root cause of corruption is the colonialism and Neoliberalism that hollows out the state," Danto added. Danto is adamant that Jovenel Moïse is legally disqualified because of voter fraud. "The two other candidates that came second and third should go to a run-off for president: Jude Celestin and Moïse Jean Charles - as quickly as possible because the people need to move on to a state that will be concerned about their immediate needs and welfare," Danto says. This is something that Haiti must do on her own, without the appearance or reality of outside interference. "Once there is a president, either Celestin or Moïse Jean Charles, then the new Trump team in Haiti and its ambassador must work with the duly elected president to bring into application the matters Senator Sansaricq has noted in his memorandum to you." "The Haitian state cannot defend the people against the current criminality that Neoliberalism and occupation has wrought. But we also must be an example of something new in Haiti, and apply the laws, respect the people's votes for Jude Celestin and Moïse Jean Charles. Give them a chance to deal with honest men who have fought the criminals with dignity without selling out. Haitians must continue to strategize on the "how" to drain the swamp within the law." We mentioned that Danto has already begun to drain the swamp with clean water. The sign says: "Clean water is the life, health and the solution to cholera"
At the time of this writing, Danto happened to receive a batch of photos from a water delivery at Camp Canaan, the largest of the IDP camp, via a rented truck. "I was so hoping the Trump folks would appreciate our support and help us with this and the radicals destroying the rule of law in Haiti, Danto wrote. "Imagine if $10 million of the $400 million the U.N. is supposedly putting aside for clean water, came to Zili Dlo, a Haiti-led, Haiti-capacity building project run by Haitians! A Senator, an Historian and an Attorney with solid suggestions. Food for thought.